Petalite is lithium sodium aluminum silicate, it’s crystal system is monoclinic. It crystallises relatively rarely and most often occurs as large, cleavable masses. Its colour can be white, colourless, grey, pinkish or yellow. Colourless pieces can be faceted into exceptionally sparking gems. Some can be cabbed into cats-eyes. Patellate forms in granite pegmatites and is often associated with other lithium-bearing minerals, such as Amblygonite, Kunzite, Spodumene and Lepidolite. Patellate is found in Australia, Brazil, Sweden, Namibia and Afghanistan. Petalite is said to be soothing and healing for the emotional body. It said to also be excellent for healing all types of emotional trauma but is particularly valuable for overcoming abuse/victim patterns. Said to be an ideal protective stone for children overcoming abuse, or who are having difficulty in maintaining their centres in the face of bullying. 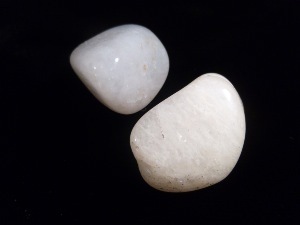 Petalite may bring a frequency of calm self-acceptance and self-love. Petalite may be used for ADD, ADHD, excessive worry or stress, and other instances of overactive ego-mind. It may also be helpful in regulating blood pressure and countering anxiety attacks.